Are you struggling to manage your debt? If you are feeling overwhelmed by the burden of your debt and unable to make on time and consistent payments, you might want to consider consolidating your debt. Debt consolidation is a debt management strategy. The term describes the process of rolling one or multiple unsecured debts into another form of financing. In other words, you take a new loan and use it to pay off existing debts, which leaves you with just one loan to worry about. 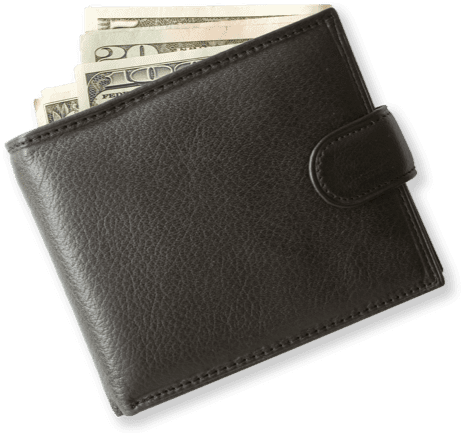 Used properly, it can reduce your number of bills, lower the cost of carrying debt while you pay it off and help improve your credit score over time. Keeping up with multiple due dates, interest rates and payments on various debts can be so mentally draining for some that it just becomes another chore. The more debts you have, the more difficult it is to stay ahead of their due dates and the more likely something will fall through the cracks. If you miss a payment or make a late payment, you could face penalties that may cost you even more money, and no one wants that. Consolidating your debt can help to reduce the hassle involved in paying off multiple debts, as well as other financial benefits. There is more than one way to consolidate debt, and not every type of consolidation is right for each individual. Keep reading to learn more about your options. Although there are many ways to consolidate debt, it generally works the same way: You pay off one or more debts with another form of debt. From there, the similarities between the different methods of consolidating debt tend to vary widely. Depending on your unique situation — how much debt you have to consolidate, your credit score, how soon you need the funds, what type of debt you have, etc. — one method may work better for you than another. Here’s a look at 4 different ways to deal with your debt: Balance transfers, personal loans, home equity loans and debt management plans. Once you consolidate your debts, regardless of which method you use, you will have one bill to pay. Staying on top of one bill may be less stressful than having multiple bills and debts seemingly chasing you for a payment each month. 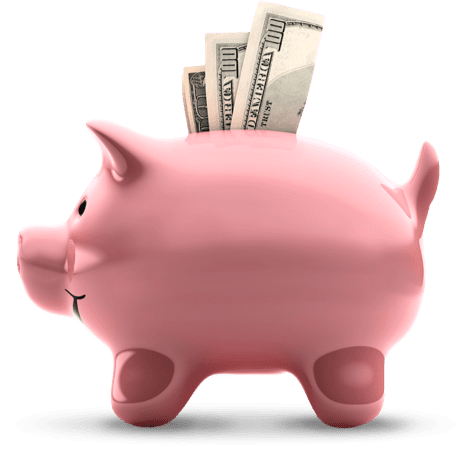 With installment loans like a personal loan or home equity loan, your interest rate and term are fixed and your payment is the same each month, so the bill is predictable and may be easier to budget to afford. Ideally, you will use a financial product with a lower interest rate to pay off debts charging a higher rate. The reduction in interest will help you save money you would have been required to pay had you not consolidated your debts. It also saves money on late fees, missed payment penalties and other consequences you may face when you have a difficult time managing debt. Depending on the size of your debt and the difference between the two interest rates, your savings may be worth thousands of dollars. 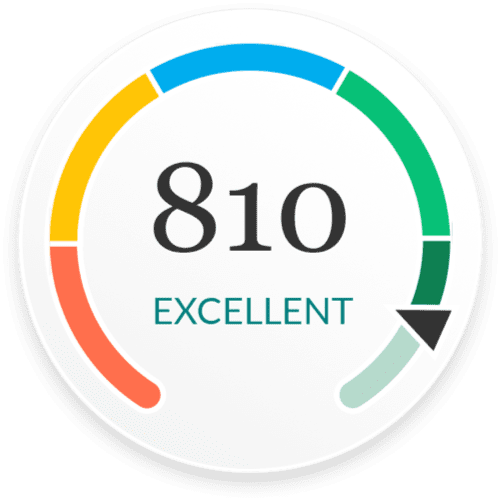 If you use financing to pay off debts in collections or the balances on your credit cards, you may notice an immediate boost to your credit score. 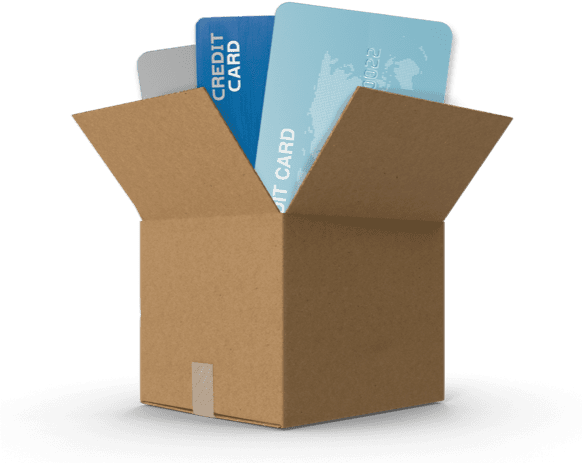 If you use a balance transfer credit card, opening a new card will increase your overall credit limit, reducing your credit utilization ratio — the total amount of credit available to you that you are using up on your credit cards. Credit utilization accounts for about 30% of your credit score. A healthy utilization ratio hovers between 10% and 30% of your total credit limit. Personal loans and home equity loans don’t have much, if any, impact on your utilization ratio. If you use either of those vehicles to consolidate credit card debt and avoid racking up more credit debt, you may initially see your credit score spike after paying off your credit cards. The months and years that follow can make the larger difference to your credit score, but only if you don’t rack up more debt as you pay off the consolidated debt. As you focus on paying down the loan, each on-time payment will be recorded and reported to the credit reporting bureaus and the positive activity will help to strengthen your credit score over time. To put the impact into perspective, your on-time payment history accounts for about 35% of your FICO credit score. Consolidating your debts can be a helpful tool that you can use to more effectively manage your debt. But it will make more sense for some borrowers than for others. Here’s when it could be a good move. Borrowers with good credit and a debt-to-income (DTI) ratio of 50% or lower are most likely to benefit from consolidating debt. If you’re among this group, you’ll have a better chance to get approved for a debt consolidation loan of 0% credit card that you can use to consolidate debt. Lenders also reserve lower rates for applicants with good credit — if that’s you, you’ll have a better shot at getting low debt consolidation rates that will save you money. If you’ve run up high balances on credit cards, for instance, a loan for consolidating debt can lower your interest costs now and help you get out of debt faster. If you owe $7,500 across credit cards with an average APR of 25%, for example, interest charges alone will be $156 per month. Consolidate these debts into a lower-interest personal loan with a 13% APR, however, and you’d immediately cut interest costs nearly in half to just $81 per month. A loan can also be helpful if you’re looking to lower monthly payments and free up cash flow. Perhaps you took out one or two personal loans a few years ago and the payments are stretching your current budget too thin. You could consolidate these loans with a longer term, stretching payments out and lowering your monthly costs. Borrowers looking to pay more each month might also benefit from debt consolidation. They’ll just want to choose a shorter loan term, which has the added benefit of often being paired with lower rates. If you’re considering this move, make sure you can comfortably cover the higher monthly payments each month. Lastly, debt consolidation should be just one part of your plan to get out of debt. Get a strategy in place to help you practice better spending and borrowing habits. Set yourself up for success in repaying your debt consolidation loan or credit card balance, and commit to staying out of debt in the future. When could consolidation be a bad idea? Debt consolidation isn’t a one-size-fits-all solution, however. This strategy can be beneficial for many borrowers, but it won’t be right for others. Here are some signs that consolidation might not be right for you. After consolidating credit card balances, you want to be sure you won’t turn around and charge up a balance again. If you haven’t worked on the poor spending and borrowing habits that got you into debt, it wiser to improve your money management before considering consolidation. These factors will keep you from getting approved for consolidation loans or other credit. Or if you do get approved, you might only qualify for high rates that won’t save you much, or could even be higher than what you’re already paying. A debt that is smaller and more manageable might not be worth consolidating, as it’s unlikely to generate enough savings to make it worth your while. If you can pay the balance off in less than a year by making extra payments, instead, this can be a simple and just as effective way to tackle smaller debts. For debt that is overwhelming and too large to realistically repay, consolidation is unlikely to be an effective solution. Consolidating debt can only help so much, and it won’t change what you owe. You might also have a tough time getting approved for a large debt consolidation loan that you can’t afford. Explore other options that might provide the support you really need, such as finding debt relief and assistance programs or even considering bankruptcy. These personal loans come with fixed APRs and lump your debt together so you can pay it down in fixed monthly installments. This moves your high-interest credit card debt to a card with a lower interest rate or, possibly, a card with a promotional 0 percent APR period. This converts your home’s equity to cash you can use to pay off more expensive debts, such as medical bills and student loans. A debt relief company will help negotiate all your debts to potentially get you better monthly payments and interest rates. Provides a strict debt repayment schedule. These loans have the potential to save you money, but it’s not a guarantee. Whether you could save money by consolidating debt will depend on your costs and what you’d pay after consolidation. You’ll have the best chance of saving money by consolidating if you use this option to secure a lower interest rate or pay debt off faster. Our debt consolidation calculator can help you see what your monthly and total costs could look like after taking this step. You can compare that to your debt costs to see if consolidating could help you come out ahead. Can it help me get out of debt faster? If your goal is to get out of debt faster, consolidating your debts can be a smart move. Consolidating with a personal loan, for example, can give you the option to choose a shorter loan term, so your debt will be gone sooner. Some applicants can qualify for personal loan rates that are lower than what they’re paying on existing debts. This can lower how much this debt is costing them so that more of their debt payments are applied to taking down their balance. If you want to use debt consolidation to pay off debt faster, keep an eye on monthly payments. A shorter loan term will increase payments, and you’ll want to make sure they’re affordable. What are my options to consolidate debt? If you’re aiming to consolidate debt into a single loan or credit account, there are several different types of credit you can use to do so. Personal loans: A personal loan is an unsecured installment loan. You borrow a set amount and repay it through fixed payments over a specific term. With a personal loan, you can choose the loan length you want to get affordable payments. 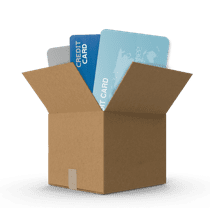 Credit card balance transfer: If you have a smaller credit card balance that you can pay off within up to 21 months, consider a credit card balance transfer. You can open a new credit card that offers an introductory 0% APR. Then, you can transfer other credit card balances to this card and repay them interest-free. Compare balance transfer fees and credit limits on 0% cards before you apply. Home equity loan or home equity line of credit (HELOC): If you own a home and have built up equity, you can borrow against that equity with a home equity loan or HELOC to consolidate debt. These can be easier to get approved for and can come with lower interest rates. But watch out for closing costs and weigh the risks of using your home to guarantee this loan. Debt relief: This option can help you get ahead of debts that are growing faster than you’re paying them off. Debt relief options include debt settlement, credit counseling and debt management. These debt relief programs use somewhat similar approaches to help you set a plan to repay debt and follow it. Bankruptcy: If you are unable to repay your debt, consider filing for bankruptcy. This will trigger a legal process through which some of your property will be used to settle what debt you have, and the rest will be discharged at the end of the process. When you’re deciding how you might consolidate debt, it can help to understand the difference between secured and unsecured options. Secured loans are types of debt that are tied to an asset you own, called collateral. Home equity loans and HELOCs are common examples of secured debt that can be used for consolidation. Your collateral property acts as a guarantee for this debt. Because of this, some borrowers can more easily qualify for a secured loan and might pay lower rates. But if you stop repaying it, the lender has the right to claim the collateral and sell it to settle the debt. Unsecured credit doesn’t require that you have or put up collateral for the loan. Types of unsecured debt used for consolidation include personal loans and zero-interest credit cards. With no collateral on the line, lenders will rely more on an applicant’s credit score to decide whether to extend a loan and how to set rates. There are several places to seek a consolidation loan. LendingTree tools could help connect you with lenders willing to work with you. They can quickly generate multiple offers in one place, making it easy to compare offers and start your search for the right one. What does it cost to consolidate debt? There may be costs that come with consolidating debt, so it’s important to review all rates, fees and costs for each option you consider. Each form can come with fees. For example, some (but not all) personal loans charge origination fees, while a home equity loan can incur new appraisal fees and closing costs. Even a credit card balance transfer can come with a fee. Once you decide what type of debt consolidation you want, you should try to get loan offers. 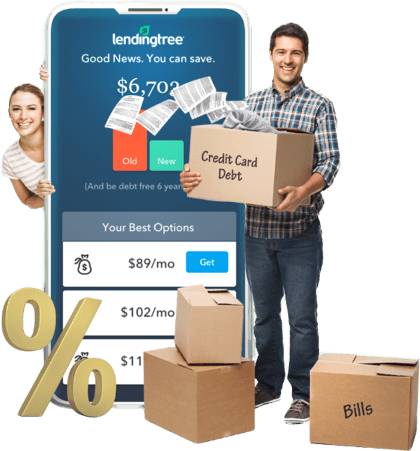 LendingTree offers several tools that can connect you with potential lenders who can meet your needs. You could then compare consolidation offers to see which could give you the lowest costs when you look at both fees and interest rates. What’s the difference between debt consolidation loans and debt relief? Debt settlement is a service offered by some companies that charge a fee to try to negotiate down the amount of debt you owe or eliminate your balance for less. You can also try to settle your debts on your own without the help of a company. Credit counseling is a service that a counselor provides to help you manage expenses and debt payments more effectively. They’ll help you get on a budget and debt plan that is affordable and will get you on the path toward paying off debt. Debt management and debt relief are terms for programs that allow a company to manage debt repayment on your behalf. Typically, you’ll make a single payment to your debt management company, which can negotiate debts and monthly payments. The service provider will divvy up your payment to each of your creditors, often keeping part of it as a monthly administration fee. Debt relief programs are administered by both nonprofits and for-profits, and the costs, fees and terms of these programs can vary widely — keep an eye on the fine print and make sure you understand everything before signing up for a debt relief plan. Do I need good credit to consolidate debt? Applicants with good credit will have a wider range of debt consolidation options. They can more easily get approved for loans and will qualify for lower rates and fees that will keep them affordable. Still, there are options for bad credit, and some lenders are willing to work with applicants who have fair credit. Borrowers with bad credit can look for other ways to qualify for a debt consolidation loan. A secured loan might be easier to qualify for, for example, or they could apply for a loan with a qualified cosigner. Will consolidating debt affect my credit score? Consolidating your debt can affect your credit score. There might be a small drop in your credit score after consolidating debt since you are taking out a new credit product or loan. You might also see a dip in your credit score if you settle a debt or work with a debt relief service. But some people can see their credit score increase by consolidating debt, particularly credit card balances. Using a personal loan to pay off credit card balances will lower your credit utilization ratio, which can give your credit score a boost. Whatever the initial effect has on your credit score, debt consolidation can help you increase your credit score over the long term. If you choose an option with affordable payments, you can keep up with on-time payment history, which is central to a good credit score. Are there times I shouldn’t consolidate debt? You have small balances that you can pay off quickly. If you owe a smaller balance that you could repay in a matter of months, it might be faster and more cost-effective to make extra payments and eliminate this debt on your own. Refinancing might be a better option. Debt consolidation isn’t right for every type of debt. For student debt, it might be smarter to refinance with a new private student loan instead of consolidating. Refinancing is probably wiser for car loans or home loans. You’ll pay more if you consolidate debt. Some people can save money by consolidating debt, but not everyone will. If you’re offered debt consolidation rates that are higher than what you’re paying, you might want to stick with your existing debt instead of consolidating. You can’t qualify for the credit needed to consolidate debt. If you have bad credit, you might not get approved for a personal loan or other credit to consolidate debt. It could be smarter to work on improving your credit score and revisiting the idea of consolidation once it’s improved. Your debt would be unaffordable, even after consolidation. When you’re struggling to keep up with payments and your debt has become a crisis, you might need a a different solution. This is when you might want to consider a debt relief program that will help you get your debt under control. For some people, filing for bankruptcy might also be worth considering as a way to get relief.